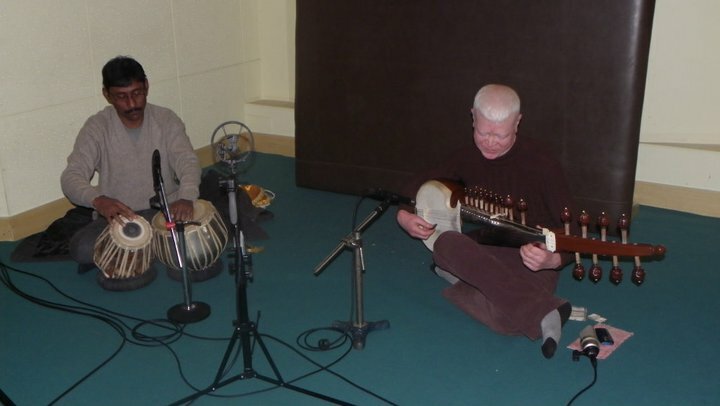 A Day in Studio A – Sarod, Tabla, and… an iPhone? It’s the morning of December 22nd, 2010 and despite the bright blue skies and sun shining down, it’s rather brisk outside. That being said, it is winter in Nepal so it’s to be expected! On my back I carry my recording rig as we walk through the side streets of Kathmandu, on our way to Music Nepal. Hidden in the back alleys (like every good studio should be!) of Kathmandu, Music Nepal is one of the country’s top recording studios and record labels. After a few wrong turns and a little backtracking, we walk through its gates and up into a small office. There is still a session running so while we wait we’re treated to some biscuits and milk tea. Always good to defrost the fingers. The tea is finished and I’m feeling warm as we enter Studio A of Music Nepal. I’m pleasantly impressed. The studio is modest but very professional. Acoustic treatment lines the walls and in one corner a selection of high end microphones pose proudly, still on stands from the previous session. Everything from Neumann to AKG can be seen as the local engineer finishes wrapping cables, placing them neatly on the nearby racks. It’s decided that the duo we’re recording will set up near the back wall. The wall in question is actually a large convex shape which we hide behind the leather ottoman that previously occupied the space (see top photo). As the musicians unpack and tune up, I pull out my Manfrotto stand (didn’t forget it this time!) and mount my Schoeps MS pair on top. Recording a duo like this, ideally, I would use an XY technique. This would allow one microphone to be pointed directly at each instrument, providing an on axis response. Alas, I’ve only got one set up (as is often the case when doing location recordings on the other side of the world..) so I have to go with it and hope for the best! I decide that a direct sound will work best in this particular room, with the sarod primarily in the right channel and tabla in the left. So I position the MS pair (which can be seen just to the right of Suresh’s head in the picture on the right) up close between the two musicians, making slight adjustments as they sound check in order to get the sarod slightly more on axis to the negative side of the S (or Side) capsule. 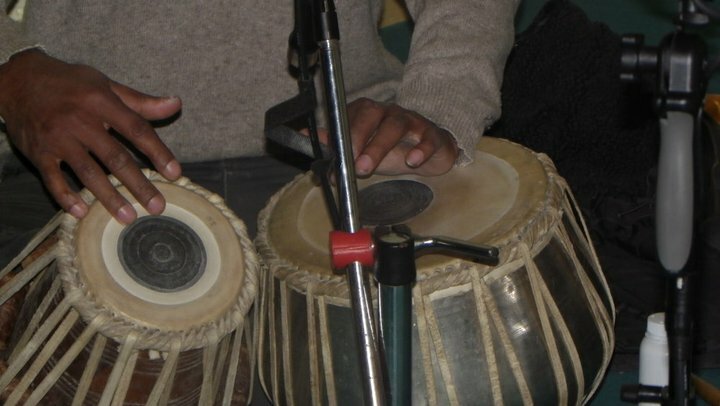 With this positioning the tabla is now almost directly between the M (or Middle) and S capsules which will make up for the difference in volume between the two instruments. Tabla, like many drums, is almost always too loud in these situations. I set my gain levels on the 702 and have one last listen. Everything sounding good, ready to hit record, then… What is this?! Suresh pulls from his pocket an iPhone, placing it on the floor to his left. Flicking through his apps he pulls up an electronic tambura and starts it droning. I pull my cans back on, have a quick listen and it actually sounds fine! Phew! This first piece is a long one (almost 25 minutes so hopefully you’ve already hit play!) but once you get into it you really start to lose yourself in the rhythms and movement (hopefully you’re doing that by now too). It is an original piece composed by Suresh, a raga with a ten beat cycle and tuned to a root note of C. Half way through the tabla comes in so make sure you keep listening to hear some of the most skilled use of this instrument you are ever likely to come across. …By the time this piece ends I’m so entranced I could keep listening all day. “It’s almost surreal”, as Greg Simmons poetically puts it. After a short break and a tune up it is time for the second piece, another raga, this one clocking in at just over 8 minutes. Again the work from both musicians is superb and I start to get lost in the music once more. One thing that really amazes me is the number of different sounds that can be made on the tabla. At times I look up to see how he is able to create certain notes – A finger tap here, a push of the palm, and flick of the nail there, Rabin makes it look so easy! (If you’ve never tried to play a tabla, trust me, it isn’t!) His playing is so controlled that my off axis positioning is totally unnecessary! I’m blown away by the musicianship displayed. Sadly then, it all comes to an end. I applaud as Suresh thanks the audience and hits stop on his iPhone, the drone coming to a jolting silence. The recording session is finished and I’m generally pleased with the result, especially considering the circumstances. I pack up and head on back to the guest house. An afternoon of haggling with shopkeepers awaits! – All photos courtesy of Jonathan Olegasegarem. This is great! Really great job capturing everything! 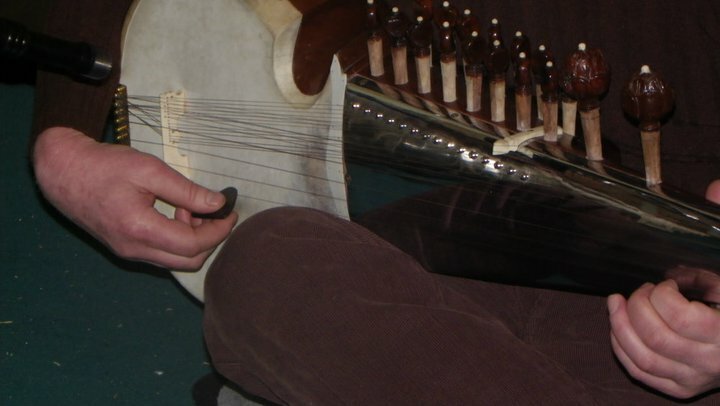 I’m looking around for tips on how to record sarod and tabla and there really isn’t much at all. I figured MS would be a really great way to go. What Schoeps mics are you using exactly? I’ve only been at Indian music for a year, and recording a little less but I would really love an opportunity to record this kind of duo someday. Thanks for the kind words! In answer to your question, the Schoeps mics I use in my MS setup are a CCM4 (Cardioid for the mid) and a CCM8 (Figure 8 for the side). They match extremely well together and deliver a very clear stereo image as you can hear above. 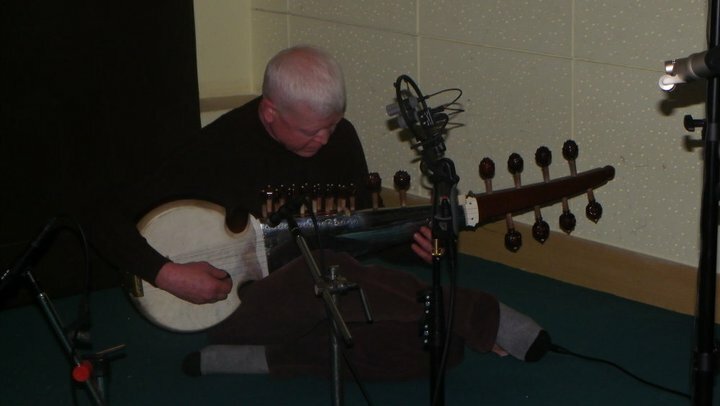 If you’re looking for a setup to record sarod and tabla as positioned in the first image, ideally I would go with an XY arrangement using two CCM4 cardioids. This would allow a mic to be pointed directly at each instrument rather than having them slightly off axis as I had to do with my MS rig. The result will be a more detailed and crisp sound. Unfortunately I didn’t have the means to do this myself! Be sure to keep in touch with any recordings you make in the future!